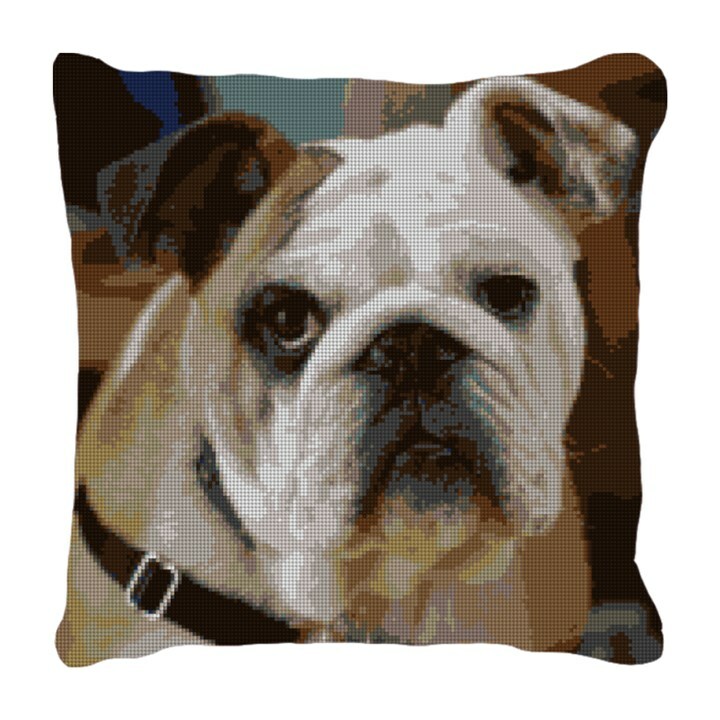 Our English Bulldog Needlepoint Kits Are Packed Full Of Personality! It is probably no surprise to you, that here at NeedlePaint we love our dogs! They are all so different in size, shape, and personality; and the perfect inspiration for designing new dog themed needlepoint kits, such as belts, pillows, wallets, and flasks. It’s hard to pick a favorite dog breed, but I would have to say the English Bulldog is definitely one of my favorites. This dog is clever, devoted and has so much personality both in physical appearance and attitude. There is a lot of love in all of those wrinkles! 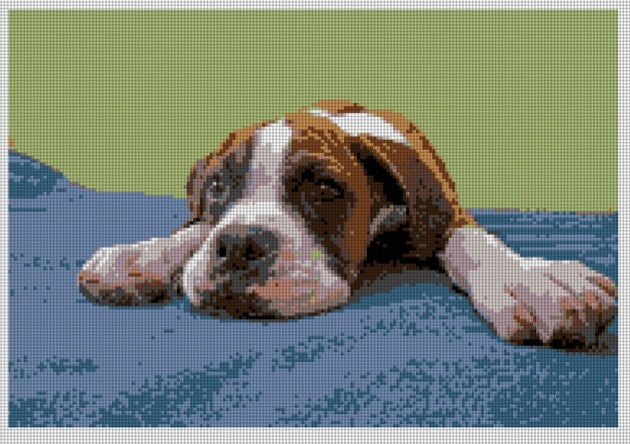 We’ve designed this English Bulldog needlepoint belt canvas with three perfectly playful poses. This breed of dog has a special spot in my heart, after once dog sitting my next door neighbors English Bulldog. This dog was getting on in years and I know her people were a little nervous about leaving, as she did everything with them. I would check in several times a day, and by day three, I could tell she desperately missed her people. It didn’t look as though she had been sleeping in her bed, but on the rug by the front door. I decided to bring a book with me on my next visit, found a comfortable spot next to her bed and began to read out loud. Two hours later, I think she enjoyed the book as much as I did or maybe having someone nearby was the remedy. Finally falling asleep in her bed, I could tell she was comfortable and content by the rhythmic snoring that was taking place. Her people came back the next day, and life was back to normal for this sweet old English Bulldog. I wouldn’t have guessed that this dog would have left such a special spot in my heart, but she did. will definitely add some life to your living space. You’ve heard the saying, “they come into our lives, steal our hearts, and life will never be the same again”, . . . so very true! 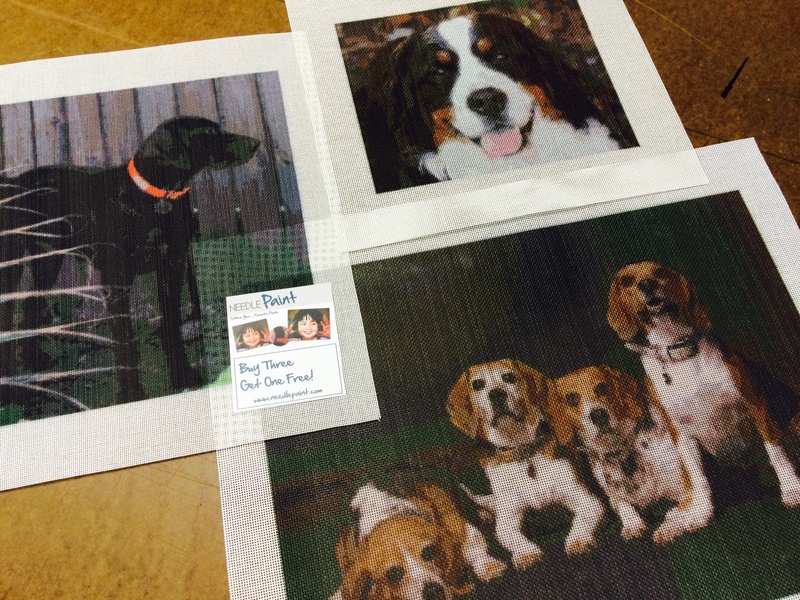 At NeedlePaint, we feature many breeds of dogs on our belts, pillows, wallets, flasks, and even offer custom dog needlepoint kits taken from your own photos. 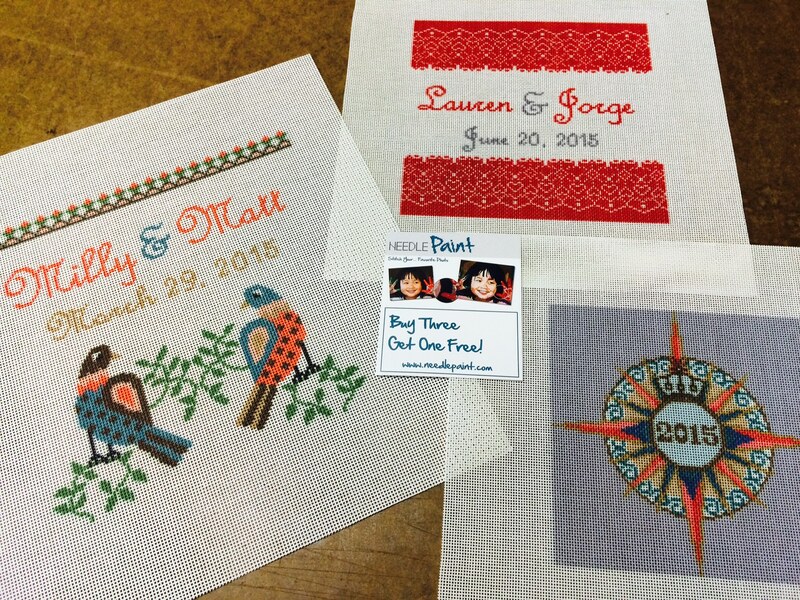 These are all available as needlepoint canvases for you to stitch, or if you prefer we will do the stitching for you. This is a great way to celebrate or commemorate, the dog that touched your heart. long needed personality to that tired old wallet in your back pocket. Below are some of the fun projects we finished last week, really some remarkable dogs and more! Hope everybody had a great holiday! Last week we were treated by some of our customers with pictures of finished projects that really stand out. 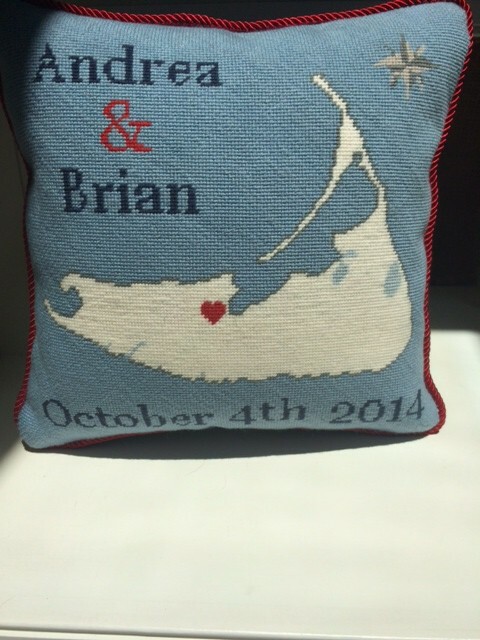 We have two needlepoint pillows, one is a dog needlepoint project and the other was a Nantucket Wedding Pillow. 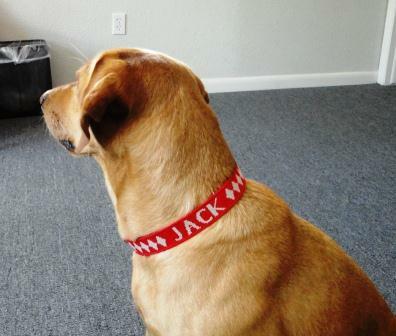 I love the colors and modern touch on the dog and with the nantucket, well the red braided piping looks great. Nice stitching Ginger and Hillary!!! It has been HOT in Denver, real hot, so hot I think we broke almost every record… So dog gawn hot! Our pooches have been enduring in the work shop with lots of cool water, and sleeping. Well, that is not really what this post is about. 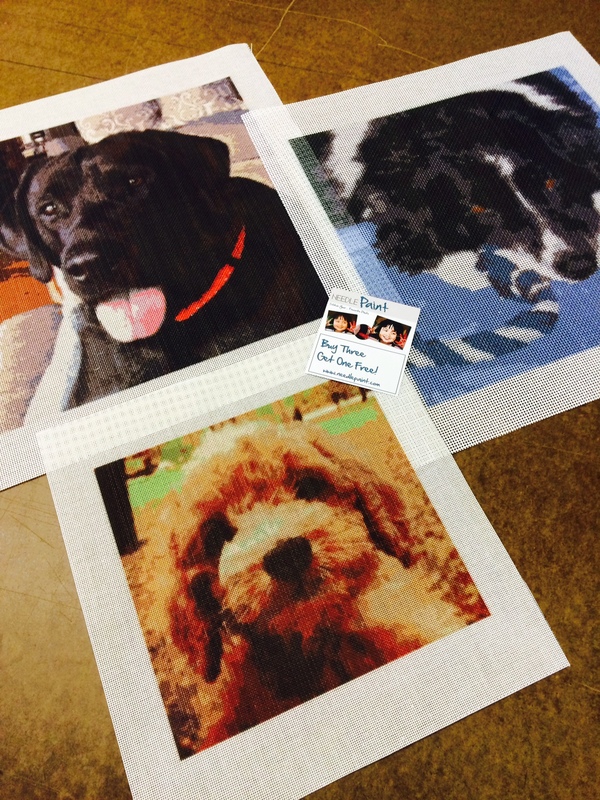 I just had to share the lovely dog needlepoint canvases we made this week! 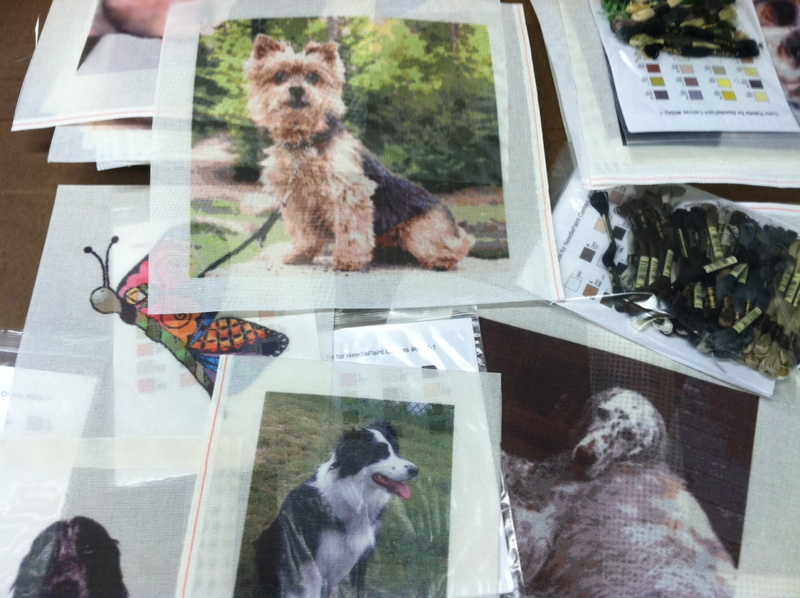 The dog needlepoint kits were all made from photos, so why not try to stitch your own dog? 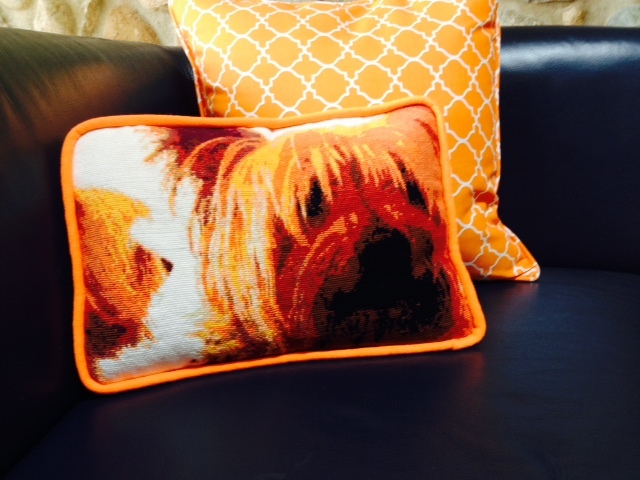 These two lovely needlepoint pillows were emailed to by Hala Alfi last week. 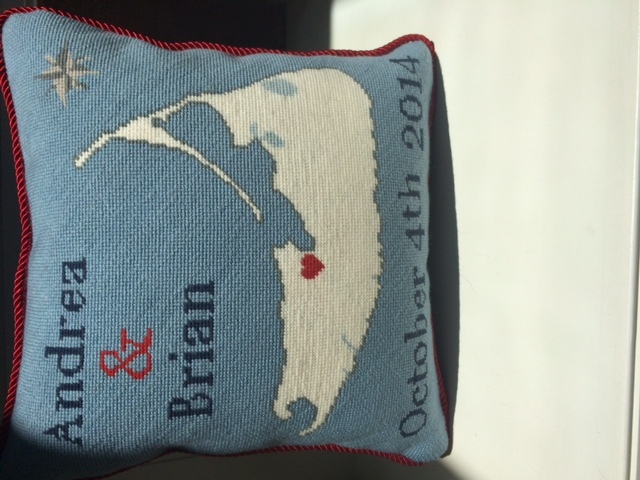 The pillows are very well stitched and they are a great way to display your talent! One of our favorite projects we see almost every week is the dogs. 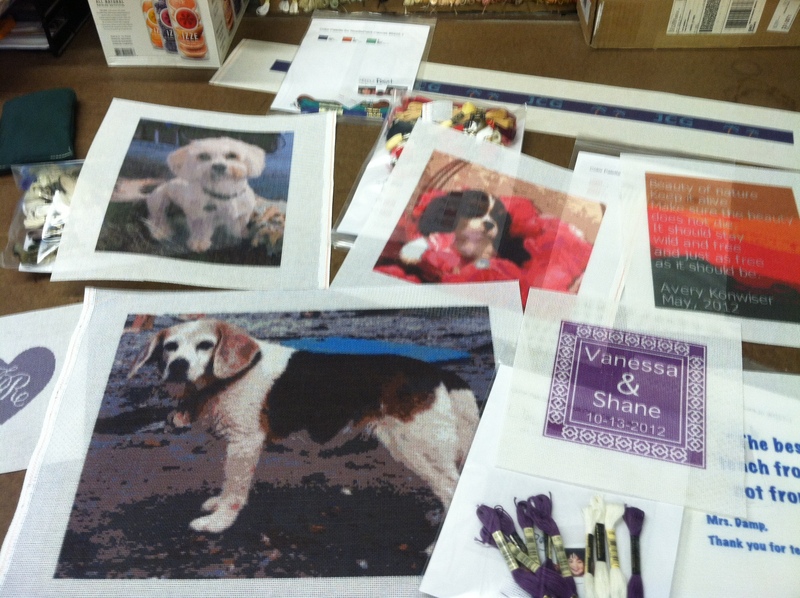 Two weeks ago, we actually had 5 dog needlepoint canvas orders, along with two cat needlepoint canvases. Some of the dogs are below. You can see that the close up images look great. Also, we’ve been working on finding more dog breeds to add to our Etsy shop. 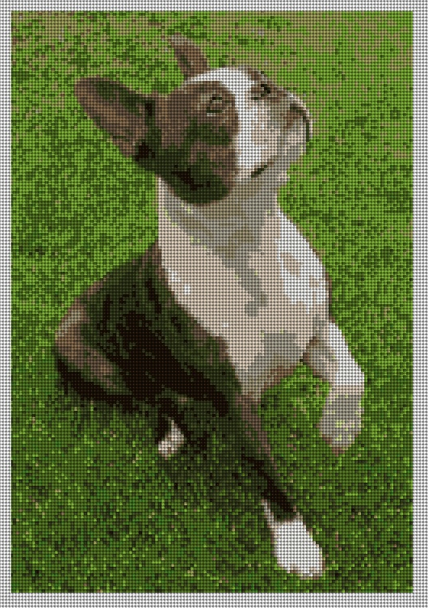 You can browse more dog needlepoint canvases there, or upload your own needlepoint photo to create a custom needlepoint kit at our website! 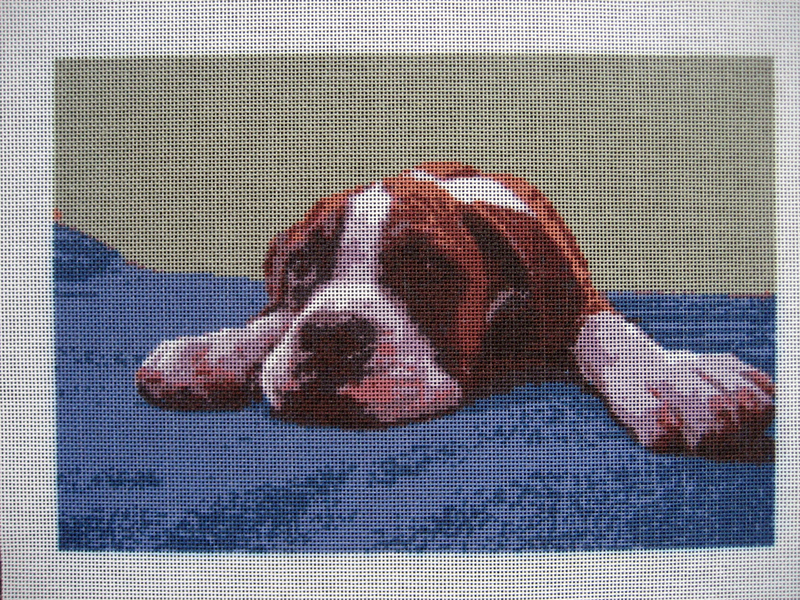 I worked on this puppy needlepoint canvas with a customer last week, and had to share it! We cropped the image, and changed the background to be all blue and green. The size was 13.3 inches by 9.2 inches, on 14 mesh zweigart canvas. We also changed some of the floss colors on the puppy to off whites and browns to match the photo better. What is great about this picture is how close up it is, and of course the puppy, it will be an amazing pillow when it is finished! 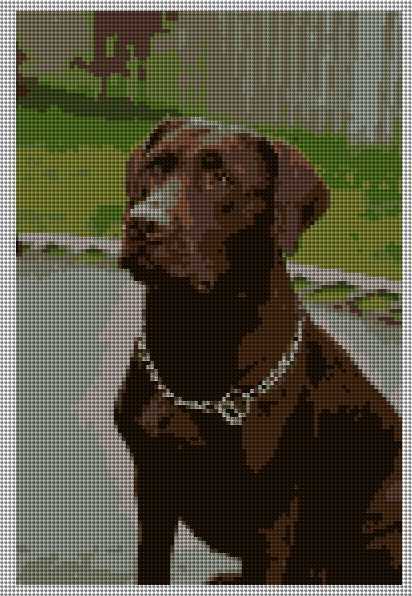 Puppy Needlepoint Canvas "Stitched Preview"
Looking for a small needlepoint project, consider making a dog collar. The needlepointing itself went quickly on a 1 in. 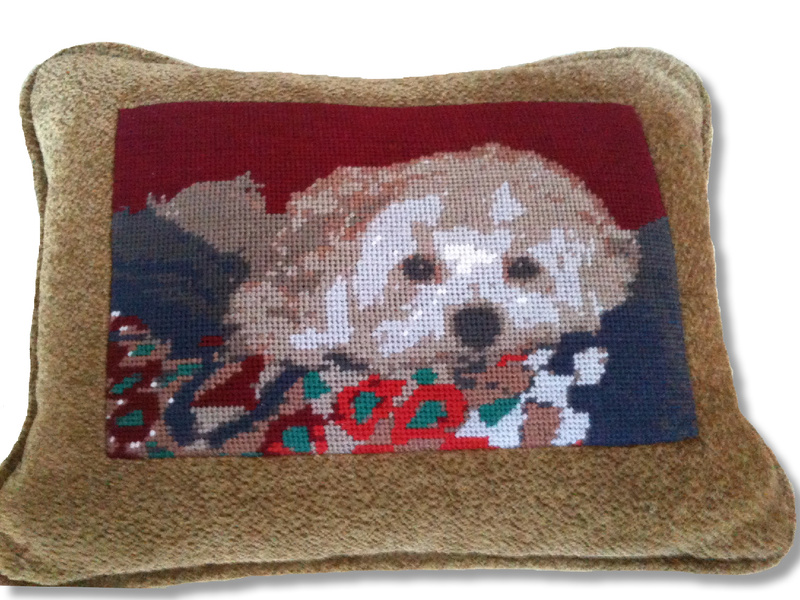 x 17.5 inch, 18-point needlepoint canvas and your choice of colors will allow you to match your dog’s personality. 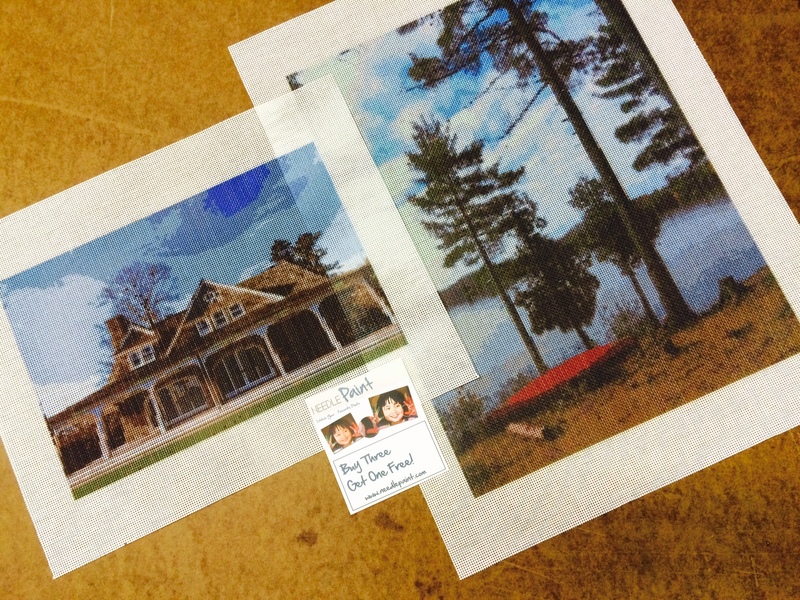 The Neeplepoint kits come with thread and matching canvas. Email us if you would like a Clip and D ring shown in the images. Position the finished collar in the center of the polyester strap. There should be 6 inches on each side of the collar. Sew in collar in place. 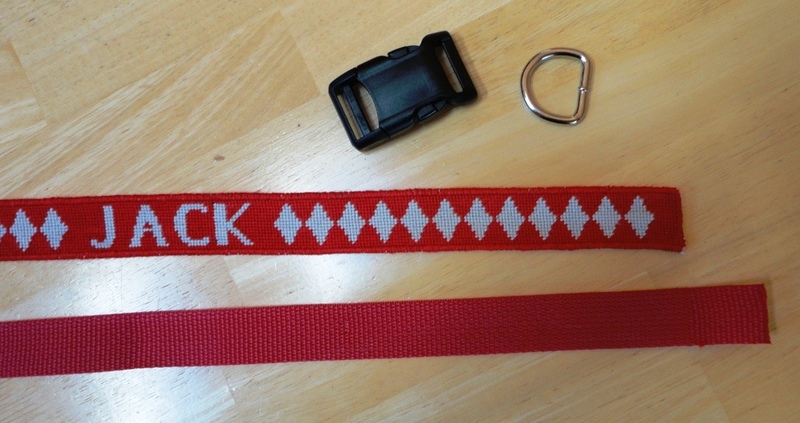 Insert the left end of the strap into the side of the buckle with a single bar. 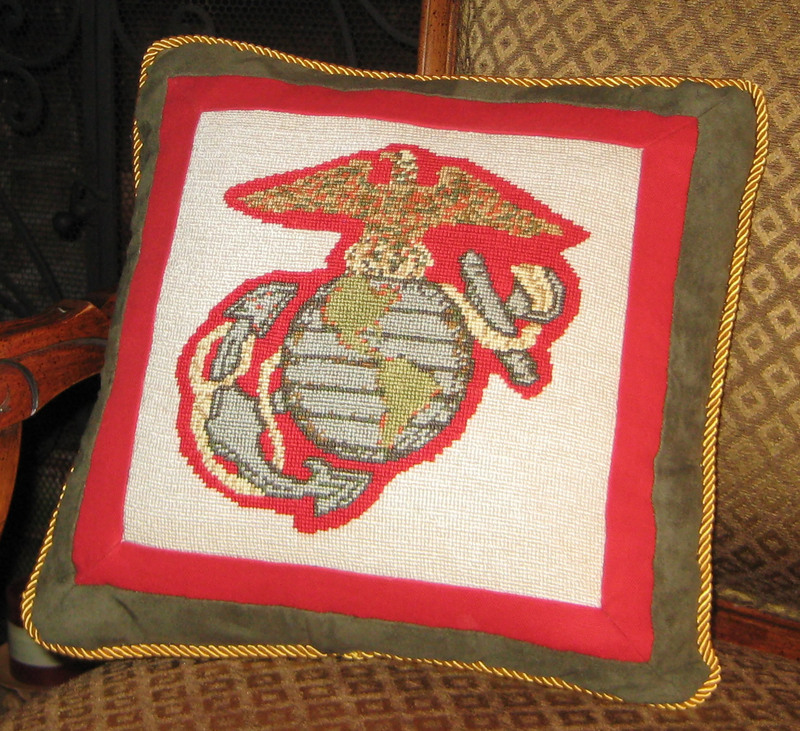 Adjust so that the finished needlepoint is snug with the face of the buckle. Sew through all thicknesses as close to the buckle as possible. Side the D-ring onto the collar and position approximately 2 inches from where the collar is attached to the buckle. Sew through all thickness on each side of the D-ring. The other side of the buckle can be adjustable when threaded as shown below. Optionally it can also be sewn making the collar a fixed size. 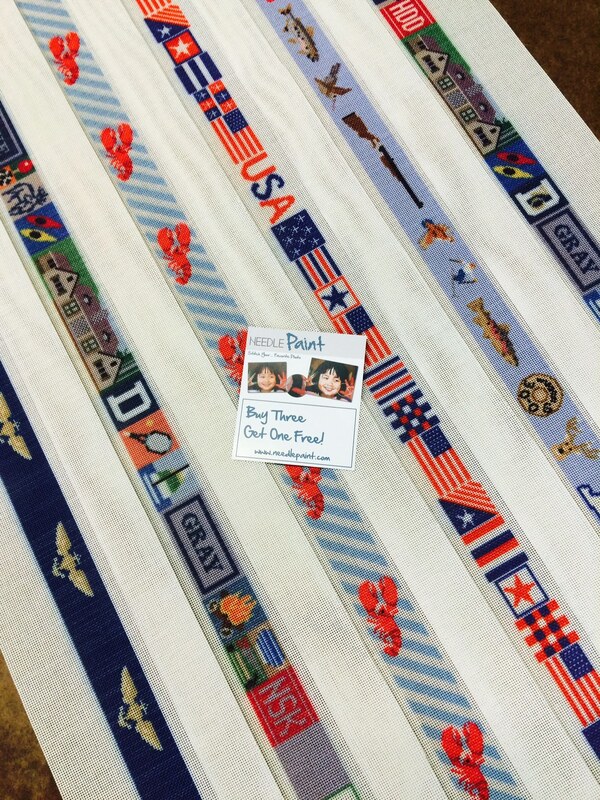 We’ve been thinking of what other projects are great for custom needlepoint, and realized that the answer is laying at our feet! 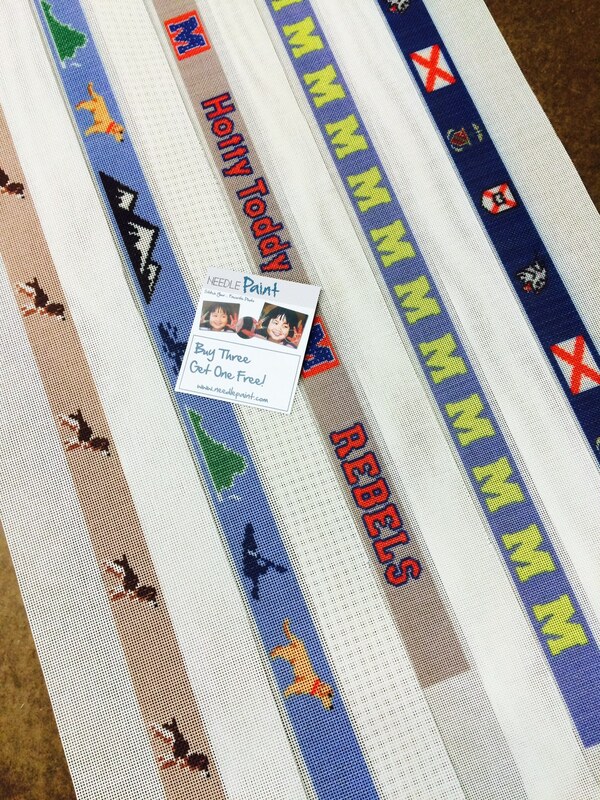 A custom needlepoint dog collar can be beautiful and make a great gift for your furry friends. 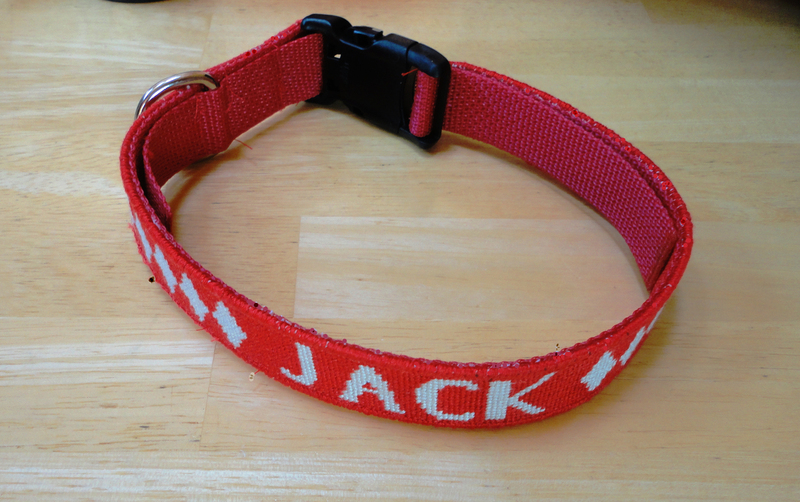 Peggy is currently working on a project for her son who asked for a ‘tough looking’ collar for his male dog, Jack. Now, look again, and see how ‘tough’ becomes girly when I change the colors! This project is just underway, we hope to have lots of designs and complete needlepoint dog collar kits on our Etsy needlepoint shop soon. All designs are customizable, please contact us if you would like us to design your dog’s needlepoint collar! We’ve been searching the internet for great pictures of dogs to offer as stock needlepoint canvases and needlepoint kits. We found some great ones! Also, check out our vintage dog needlepoint. 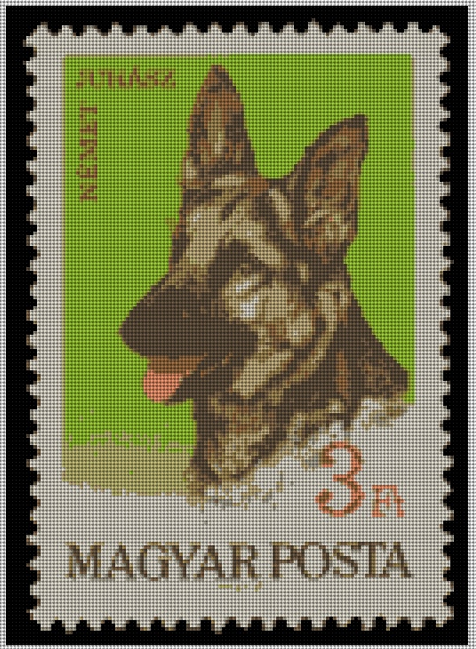 Vintage German Shepherd Dog Needlepoint - Customize with your dogs Name!